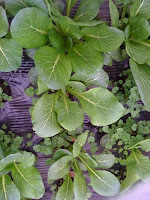 Japan Farmers Markets: Tokyo Garden Greens Ready to Eat! 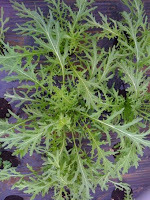 I stopped by the garden on an early morning foray. (Jet lag is good for that sort of thing.) I found beds ready for harvest! 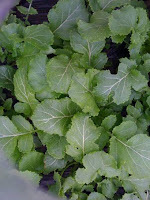 Komatsuna, red and green karashina, big heads of broccoli and cabbage, and spinach planted late last year are all ready to go. 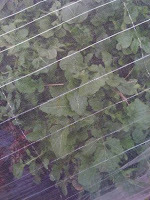 Arugula and wasabina are all showing signs of regrowth, and the kale is showing signs of life, too. All of the rows have covers - netting or plastic with ventilation holes - to keep the plants a tad bit warmer as well as keep out some critters. 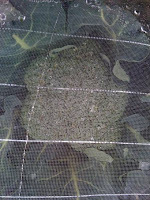 The photos of the cabbage, arugula, and broccoli are hazy due to the netting of the floating row cover, and the edges of the plastic row cover shows on a couple photos, too. 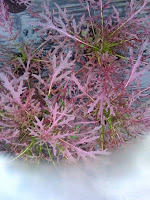 These are so beautiful - makes me crave the first greens more than I already was!